The old building without a sign on the door disguises any hint of the hurried preparations taking place inside. On one side of the main room, rectangular tables are covered with boxes of pastries and carafes of coffee. The empty gray walls are lined with stacks of tan metal chairs, now being arranged into a large circle around the perimeter of the room. Before long, people begin filtering in until the room is humming with excited chatter with mostly women ranging from 20-somethings to early 40s. Children run in circles, screaming, hands sticky with doughnuts and orange juice, giving sharp contrast to most of the adults in the room who seem apprehensive and tired, clinging tightly to their cups of steaming coffee. When 9:30 rolls around, the adults find their seats as the children are led downstairs to play, and the first session of the Lullaby Project begins. The Lullaby Project is an intensive Community Connections project in which mothers in challenging circumstances come together with specialized Seattle Symphony teaching artists and musicians to write, record and perform lullabies for their children. 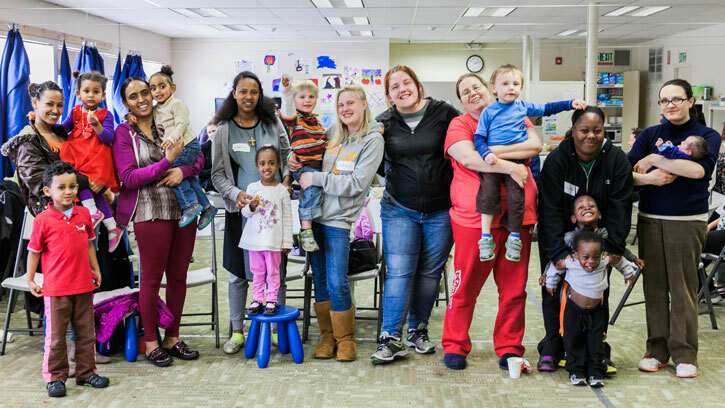 During this Creative Workshop, the first session of the project, Seattle Symphony teaching artists and staff joined the staff and mothers of Mary’s Place, a homeless shelter for families in downtown Seattle. The day began with breakfast, introductions and sharing of bedtime rituals. After these introductions the teaching artists paired off with the mothers to begin writing lullabies for their children. It was an intense day, but by the end of it, the mothers reported feeling relaxed, comforted and accomplished — a huge contrast to the stressed and overwhelmed feeling they reported at the beginning of the day. Throughout the Lullaby Project (the creative workshop, recording session, sharing session and final concert), the teaching artists and musicians were able to put into words and into song each mother’s individual stories and hopes for the future. The mothers and teaching artists, who were strangers at the start, were able to discuss, maybe for the first time, such tender topics of safety, loving a child, what it is to be a parent­ — all within the safety of a simple song. And our teaching artists and musicians were there to listen, to witness, to come alongside. But there’s no courage without fear. Ever comes without a fight. Hush little baby, child that holds my heart. Don’t shed a tear, you’re safe, Mother’s here. – Emily’s Lullaby for C.J. The Mary’s Place mothers are not the only ones who have been deeply impacted. Seattle Symphony musicians, teaching artists and staff along with staff from Mary’s Place have also been moved by this powerful project. Mary's Place Executive Director Marty Hartman commented on how this project has helped strengthen the partnership between Mary's Place and the Seattle Symphony. The partnership with Mary’s Place has become so strong that they held their recent fundraiser Brunch for Beds at Benaroya Hall. The program featured two live lullaby performances while families shared their stories of homelessness and how these lullabies helped them get through. Seattle Symphony cellist Joy Payton-Stevens also spoke, sharing that programs like the Lullaby Project provide the opportunity to remember why music is so vital and to see first-hand how transformative it can be. This project has also raised the bar for Seattle Symphony teaching artists. Several hours of specialized training goes into preparing the teaching artists who work directly with the mothers to help them write their lullabies. The Seattle Symphony will partner again with Mary's Place for this season's Lullaby Project. The project will culminate with a celebration concert which will take place the weekend of Mother’s Day on Saturday, May 7, at 3pm in Soundbridge Seattle Symphony Music Discovery Center. This free concert will feature live performances of all the newly created lullabies and is open to the public.